when you have passed the practical driving test, there will likely be many occasions that you will need to reverse your car. Straight reverse is essentially reversing in a straight line and then simply stopping. Reversing for the first time can make some a little apprehensive as it is difficult to see and harder to control the car. This straight line reverse tutorial provides the easiest method for performing this manoeuvre. Accuracy – reversing in a straight line, keeping the car parallel to the kerb and not hit the kerb or drift too far into the road. Control – keep the car very slow by use of clutch control. Think of a very slow walking speed. Observation – Constant all-round observation. Let’s begin by pulling up alongside the kerb, not forgetting the Mirror Signal Manoeuvre (MSM) routine of course. Stop a little further from the kerb than normal parking as this will give you a little more room for error. Around 30 cm is acceptable. It’s important that you stop your car parallel to the kerb and not at an angle. If you stop at an angle, you are already setting yourself a challenge to straighten the car when you begin reversing. Also when you stop alongside the kerb, ensure your steering wheel is straight as it can be difficult to determine whether it is straight after you have stopped. It’s not easy to know when you are parallel with the kerb, so we do this by using reference points. In your left mirror, you will want a view similar to this image when you stop. This is around 30 cm from the kerb. Compare this to a similar image from a parked position and you will see little or no road, only the kerb. We can also see that the kerb and car are parallel and not at an angle. This is your first and very important reference point for getting a good position for reversing. Don’t forget to ensure your steering wheel (front wheels) are also straight. You will continue to use this reference point throughout the straight reverse. A second reference point to help can be found through the rear windscreen. This image is taken from exactly the same position in the road. 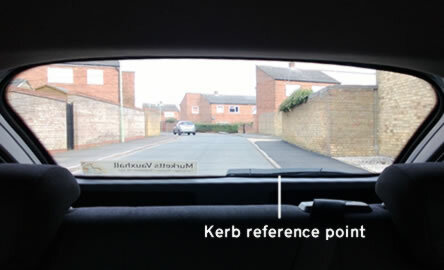 As we can see, where the kerb enters the car through the rear windscreen is your reference point. Make a mental note where the kerb comes in, or you can even place a small sticker or piece of blue tack where the kerb comes into the car to help you remember. It can be kept there for use later when practicing. When you have found the ideal position, select neutral and apply the handbrake. Reversing a car requires that you twist round in your seat, looking over your left shoulder to observe out of the rear windscreen where you are going. You may find this a little restrictive whilst your seat belt is on. You are legally entitled to remove your seat belt whilst reversing. If you find it easier to remove the seat belt, do this during the driving test too. If it makes no difference, then simply leave it on. Don’t forget to put it back on at any time you drive forward. Now we have the perfect position to begin with the straight reverse. Let’s press the clutch down, select reverse gear and place your hand on the handbrake ready to release it. You may at this time find the clutch bite point if you wish. It’s recommended however to practice all manoeuvres, including the straight reverse without using the bite point as better overall control can be maintained. You should only need to use the bite point if you are moving off uphill. Look all round to ensure no vehicles are approaching, cyclists or pedestrians that may be affected by your vehicle. If all clear, look the way you are going – out of the rear windscreen, release the handbrake and very slowly release the clutch. As you started off in an ideal position, you shouldn’t need to steer very much, if at all. If you do find yourself going off-course, simply remember, steer towards the kerb to move closer to the kerb, steer away from the kerb to get further away from it. It is essential that the car is kept slow as you need to apply constant all-round observations and to keep the car under control. This can only be done by clutch control. When releasing the clutch, slowly raise it until the car starts to move. To slow down, dip the clutch slightly, and to speed up, lift the clutch slightly. 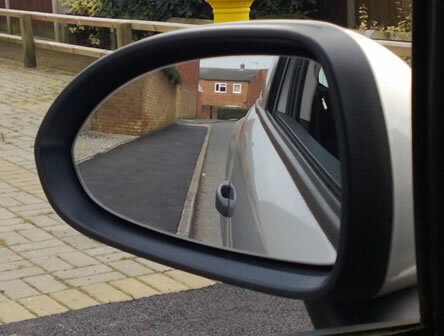 As you are reversing, you must constantly look all round for the approach of vehicles, cyclists and pedestrians. You must stop when any one of these gets close, wait until they have passed before proceeding. All though all-round observation is essential for safety reasons, your main observational priority must be in the direction you are traveling – out of the rear windscreen. At any time you stop, your final observation must be out of the rear windscreen before moving again. Keep reversing for several metres and keep practicing until perfected. When you are proficient with the straight line reverse, you can progress onto the other manoeuvres.